PlayBox Technology, a European provider of broadcast television playout and channel branding, has announced the latest upgrades to its established PlayBox product range: AirBox Neo, TitleBox Neo, CaptureBox Neo and SafeBox Neo. The upgrades include UHD compatibility, a high-efficiency user interface plus a wide range of new feature enhancements. AirBox Neo adds UHD capabilities to the core PlayBox server. It now supports UHD, HD and SD in single server. New features include a streaming input supporting HTTP, HTTP Secure, UDP, RTMP, MMS, MMSH and YouTube. RTMP Streaming Output improvements have also been added, allowing easy web streaming. AirBox Neo comes with a virtual output which now supports multiple instances. Third-party product support has been extended to Ross NK series routers and the Horita TR-100 timecode reader. TitleBox Neo provides a wide range of interactive on-air graphics and titling capabilities. TitleBox Neo provides total control during on-air session, including text selection, running speed and transitions. The graphics' feature set includes horizontal crawling text, vertically rolling credits and messages, still and animated logo graphics, analogue and digital clocks, banner slideshows and chat text with automated horizontal or vertical scrolling. CaptureBox Neo allows HD or SD content to be simultaneously captured from up to four video sources. Ingested content is available for playback seconds after ingest commences. Feeds can be monitored on a single screen and controlled via a streamlined user interface. Audio levels can be monitored as loudness/true-peak displays and adjusted when required. 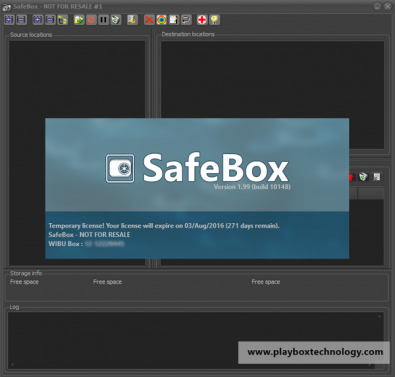 SafeBox Neo replicates remote content to local playout server folders for safe transmission. SafeBox Neo implements a new graphic interface plus new significantly faster processing for moving primary or copied content to playout and central storage servers. In addition, a new workflow routine protects content being overwritten. Expired daily schedule content is automatically deleted or moved to a predefined folder for manual deletion or archiving. Deletion can be performed automatically or by manual approval of deletion lists. Files can also be assigned specific protection to prevent removal from network sources.